It rises almost straight from the Aegean Sea to a height of 2917 meters (that's 9570 feet or nearly two miles), making it the tallest mountain in Greece and the second tallest mountain in the Balkans. Its lower slopes are broken by narrow, densely forested gorges marked by waterfalls and caves where lesser gods and other spirits were said to live. Its peaks - and there are 52 separate peaks - are snow-capped for 8 months of the year and often hidden in the clouds the rest of the time. The mountain's highest and most difficult peak, considered its summit amid a forest of false summits, is known as Mytikas. It was first reached in August 1913 by a party of Swiss climbers - Frederic Boissonnas and Daniel Baud-Bovy - led by a Greek wild goat hunter, Christos Kakkalos. Since then, approximately10,000 people a year visit to climb or hike the mountain - though very few attempt its highest peaks, Mytikas and Stefani (the home of Zeus himself). But perhaps, a religious ascetic may have climbed the mountain first. The Chapel of the Prophet Elias, on Prophitis Elias, one of Mount Olympus's many peaks, was built at an altitude of 2,800 meters in the 16th century. The Chapel, believed to have been constructed on earlier ancient ruins, by Saint Dionysios, is said to be the highest chapel in the entire Orthodox world. In 1938, 92 square miles covering the mountain and the surrounding area, became the first Greek National Park. This was in recognition of the area's extraordinary bio-diversity. it is estimated that there are 1,700 plant species - 25 percent of all plant species found in Greece, as well as 32 species of mammals and 108 species of birds on the mountain. In 1981 UNESCO classified the region as the Olympus Biosphere Reserve. It is also included in an EU list of the most important bird areas of the European Community and is currently on a tentative list of UNESCO World Heritage sites. Mount Olympus sits on the border of the regions of Thessaly and Macedonia. The easiest access to the mountain and its trails is from the tourist village of Litochoro, at the base of the mountain. It is about 260 miles North of Athens or 57 miles southwest of Thessaloniki. Getting there by car: If you choose to go by car, it makes the most sense to do it as a side trip from Thessaloniki because it is a nearly six hour drive from Athens on the E75 and E65 - part of which is a toll road and some of which is challenging. From Thessaloniki, the drive will take a little over three hours on the A1, the E75 Toll road and the EO 13. Parts of this route can also be tricky but it is shorter and less tiring. Getting there by train: The train journey from Athens involves catching a train from Athens main rail station to Larissa and then onward to Litochoro, followed by a five mile taxi journey to the village. The first leg of the trip takes about 5 hours. The trip from Larissa to Litochoro only takes 35 minutes but the train only leaves every three hours, so you have to coordinate the two legs of this journey carefully or plan on sitting around train stations for a long time. If you travel by train from Thessaloniki. there is a direct train that takes about an hour and ten minutes - followed by the taxi journey described above, and costs between £17 and £21. Trainose is the sole railway operator in Greece for intercity, suburban and international rail services. There is information on their website about schedules and booking tickets but it the website requires membership and is confusing to use. Getting there by bus: The bus journey from the main coach terminal in Thessaloniki takes about two hours and ten minutes, including a 51 minute wait between buses in Katerini. It costs about £9. From Athens is is a seven and a half to eight and a half hour bus trip, including a 51 minute holdover in Katerini. Long distance bus and train travel in Greece is not well organized for tourists and non-Greek speakers. Very little information about schedules and station locations is available online and booking online is pretty much impossible. Your best bet using public or private tour transportation from Athens is to work with an organized excursion company or to check with one of the many local travel agents at the airport or around Syntagma Square. The trip from Thessaloniki is much easier and is recommended. If you are an experienced mountaineer, hiking to the summits of Mount Olympus is not difficult, but many visitors come a cropper by underestimating the challenges and trying to hike the mountain unprepared and without a map. There are mountain rescues and fatalities on the mountain almost every year. There are several easy walks to the trailheads and into some of the more scenic gorges. You can also drive part way up, to the National Park parking areas at the head of several trails. 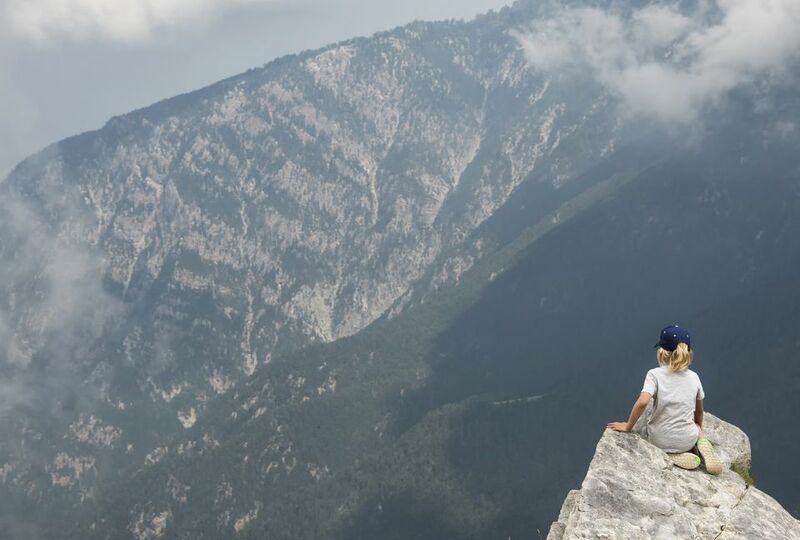 A full trek on to the Mount Olympus massif takes two to three days and involves staying overnight in one of the trail refuges as well as stamina, good balance and a head for heights. The trails vary in difficulty from III to VIII in international mountaineering standards. The safest information about trekking Mount Olympus is available from The Greek Mountaineering Club (EOS) of Litochoros, also known as the Hellenic Alpine Club of Lithochoros. Their website is in Greek, unfortunately, but their office is below the main parking lot in the village and they distribute maps and leaflets with information about Mt Olympus trails and treks. There is also some basic information about them here. An easier way for those inexperienced in mountaineering to tackle Mount Olympus, is to go with or at least consult a guide. Olympus Paths, based in the nearby town of Pieria offer a variety of guided treks for individuals and groups of different abilities, including family groups. They also offer information on appropriate preparation, equipment and clothing. Litochoro is the most convenient place to stay and is well organized for hikers, trekkers and climbers. The Hellenic Chamber of Hotels lists a variety of hotels there and in nearby towns. As with a lot of Greek websites, it takes a bit of fiddling about to get information in English. When you arrive at the English language site, forget about using the search box. Instead, click directly on the interactive map and then enlarge it. As the map grows in size, hotel symbols appear near Litochoros as well as the seaside resorts of Neoi Poroi and Leptokaria. Clicking on those produces hotel websites. If you prefer to camp in the National Park, Camping Hellas has a site near the base of the mountain. Wild camping is illegal in Greece and, though it is sometimes tolerated in certain areas, it is not allowed in the National Park or on the high mountains. What Is Retsina, the Greek Wine of the Gods?